I always think of wood as being alive. I ordered one piece of West African Ebony from Luthiers Mercantile International to cover the headstock on a Spanish cedar guitar neck, it was going to be a great contrast for the bubinga back and sides. 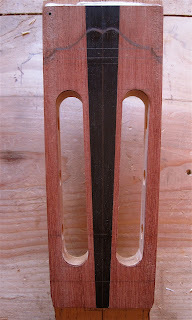 The headstock veneer fell to the floor and cracked, not a large crack and I was able to glue and clamp it together. When I was getting ready to dry fit the piece onto the headstock the ebony split full length when I was drilling a hole for one of the registering pins. I guess this piece of ebony didn't want to cover the entire headstock. Sometimes the wood tells you what you should do. 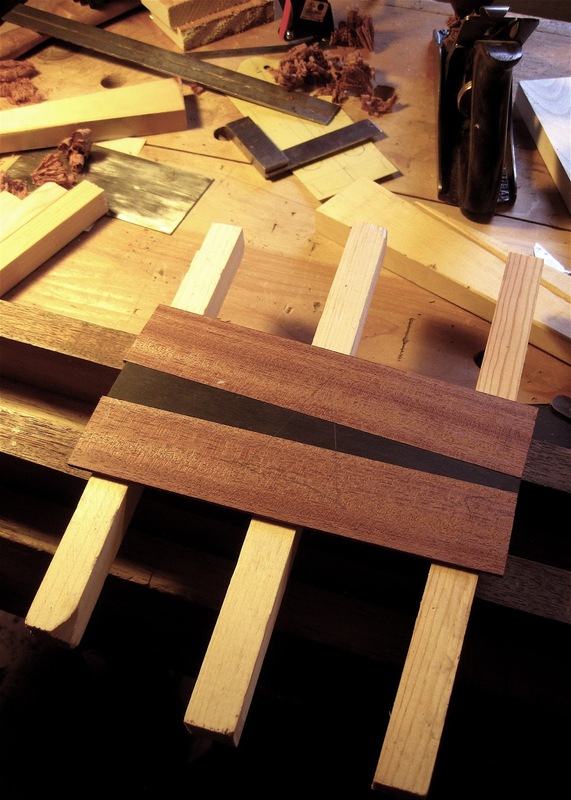 The back of this guitar is going to have a tapered fillet of ebony down the middle, it seemed best to me to match that with a mirror image in the headstock veneer. 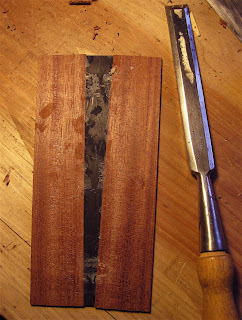 This photo shows a piece of West African ebony between two jointed pieces of bubinga. 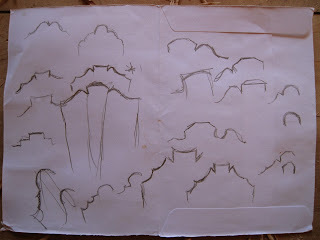 Notice that I use a cabinet maker's triangle on the pieces. 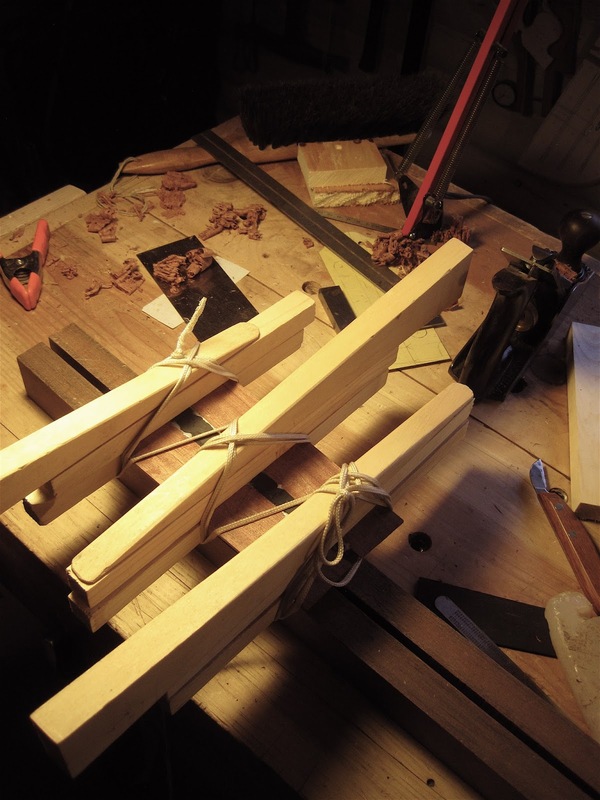 I really enjoy using this old technique of string and wedges to glue wood together! All parts lined up with no gaps. 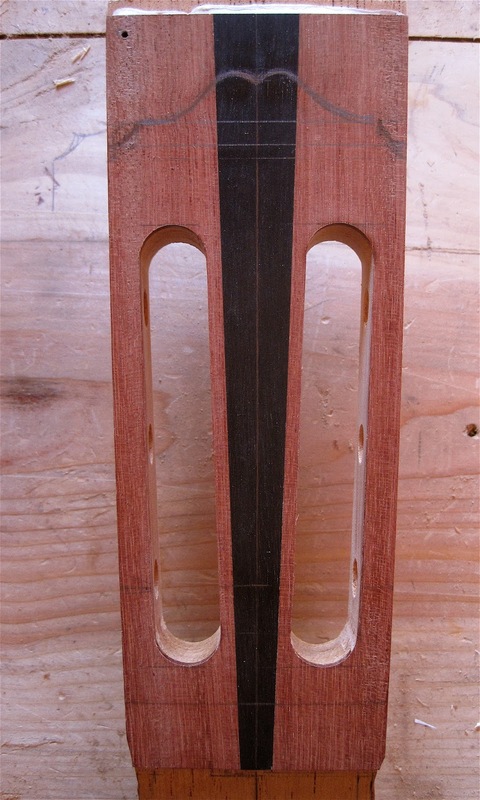 The headstock after I drilled holes for the tuning machines and cut the slots for the tuning machine rollers. I have yet to decide on what crest design I should use, this photo shows one design I like which is a blending of designs used by Domingo Esteso and Santos Hernandez. I'm not sure the double ogee is the best way to show off the end of the ebony strip. 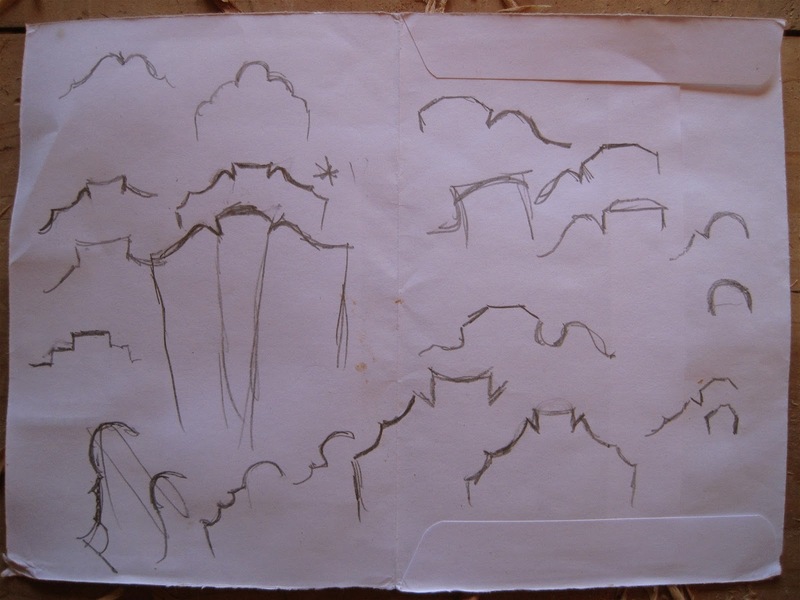 Here are some sketches that I made yesterday, the one with the asterisk by it is the crest design that my wife liked the best and I have to agree with her. Now to practice making this new crest a couple of times on some pieces of pine to make sure I get it right before I work on the real thing. Wow, Adam! Thank you for the compliment! And thanks for visiting my blog! 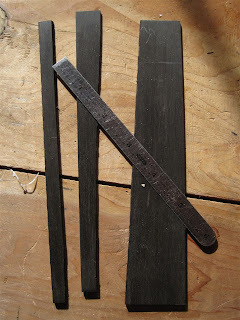 Have fun with the Douglas fir!